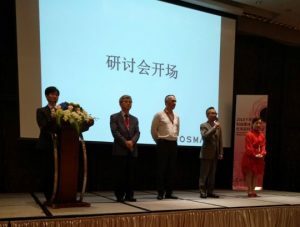 Philippe BEDOS, Managing Director of Syntivia, was invited by the Society for Cosmetic Science of COSMAX China to attend its annual exhibition in Shanghai. As expert in the domain of Cosmetic active ingredients and products development, he gave a lecture to expose new technologies for evaluation to measure biological activity and demonstrate cosmetic claims. COSMAX is a korean cosmetics R&D and manufacturing company, the wold leader in cosmetic products manufacturing. 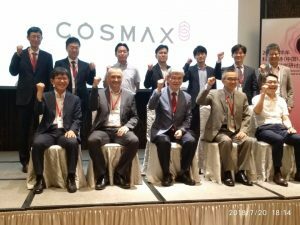 Each year COSMAX China organizes a conference bringing together all its customers and partners to keep the China cosmetic market at the forefront of technology in cosmetic development. Philippe presented the latest advances in skin models and methods of analysis: genomics, proteomics, 2D and 3D imaging, new biological targets and a new mechanisms of action. He focused in particular on studies of pigmentation, antipollution, aging and sebum secretion. These subjects always remain in the sights of the asian market. « The only important thing is the goal and the desired claim, there are many ways to get there technologically ». The asian cosmetic market is found of new technologies. The ability of research laboratories like Syntivia but also other laboratories of Cosmetic R&D, to propose new way to study skin properties and new visualization with 3D and videos seduced a lot. This type of event demonstrates the will of the players in this market to remain competitive. They want to offer ever more effective cosmetic products backed by solid advanced research and reliable results. For more information on how we study cosmetic products and develop new ingredients, please don’t hesitate to contact us.